Where’s that acrid smoke smell coming from? It’s coming from Baker’s Field Bakery, where coffee beans are being roasted—transforming green coffee beans into freshly roasted brown beans, ready for grinding and brewing. 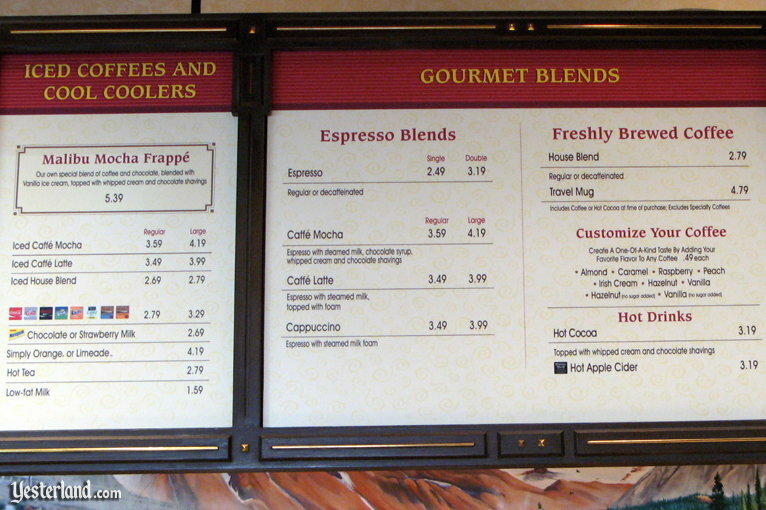 Most people like the aroma of freshly roasted beans and freshly brewed coffee. However, the smell of the actual roasting process is another story. It’s rather stinky and unpleasant. Oh, well. It probably seemed like a good idea. It’s a coffee shop, not a train ride. Baker’s Field Bakery looks like a railroad coach on the outside and somewhat like a railroad station on the inside. It’s part of the California Zephyr train, parked here at Sunshine Plaza. The entrance is right between Bur-r-r Bank Ice Cream and Engine-Ears Toys. 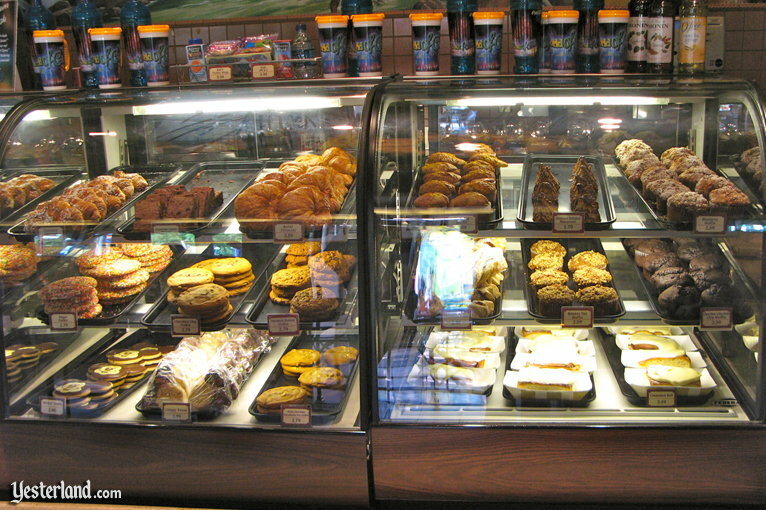 If you like to start your day with a baked treat and freshly brewed coffee, you’ve come to the right place. The long queue was designed for when things get busy, but it’s seldom needed at this park. 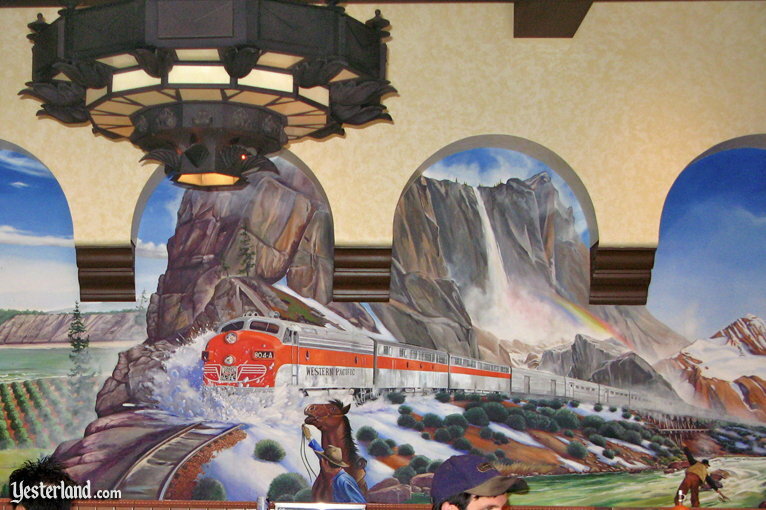 A mural of the California Zephyr splashing across a flooded track in front of Yosemite Falls dominates the wall behind the counter. It’s a montage of California images. The California Zephyr crossed the Sierra Nevada Mountains through Feather River Canyon, not through the Yosemite Valley. Are you ready to order? Check the suspended menu boards and the glass cases. 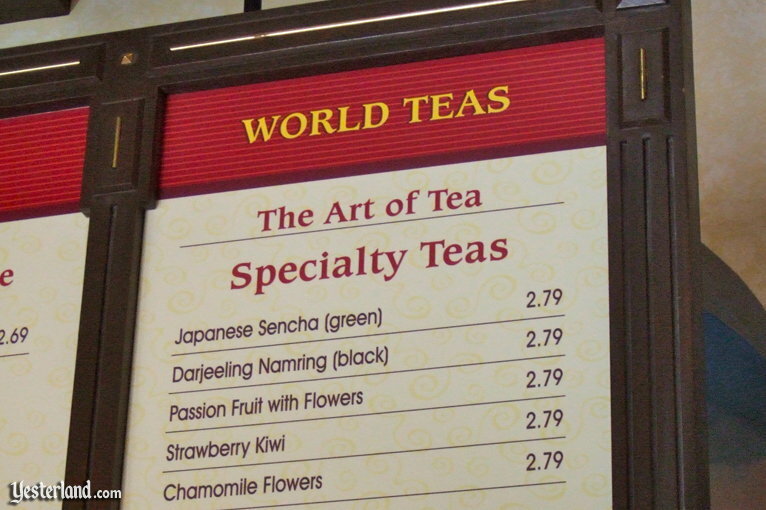 Whether you’re looking for a simple cup of freshly brewed House Blend coffee, an icy cold Malibu Mocha Frappé, an exotic tea, or something else, you should find something you like on the beverage menu. 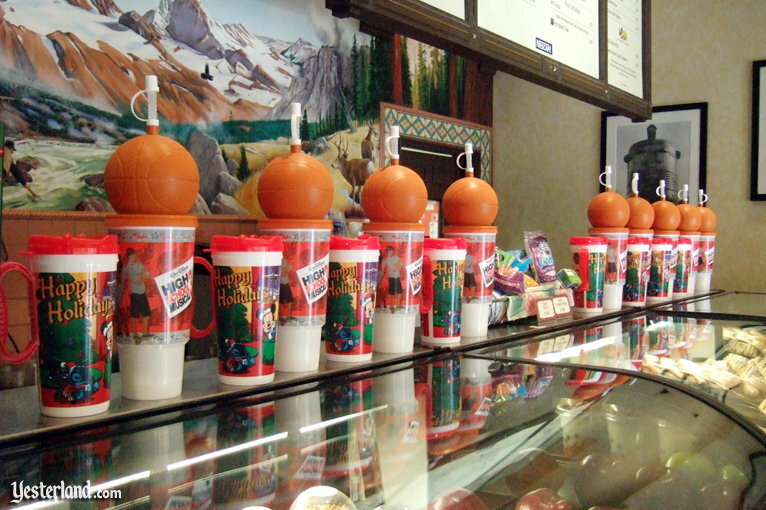 How about a beverage served in a “Happy Holidays” or High School Musical 3 plastic mug? Enough about beverages! After all, this is a bakery. 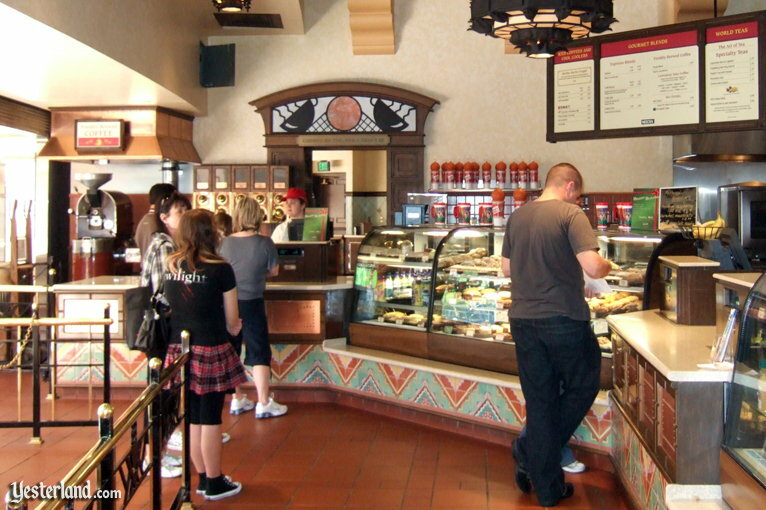 This isn’t just a place to get cookies, muffins, and pastries; it’s also a place to get meals. 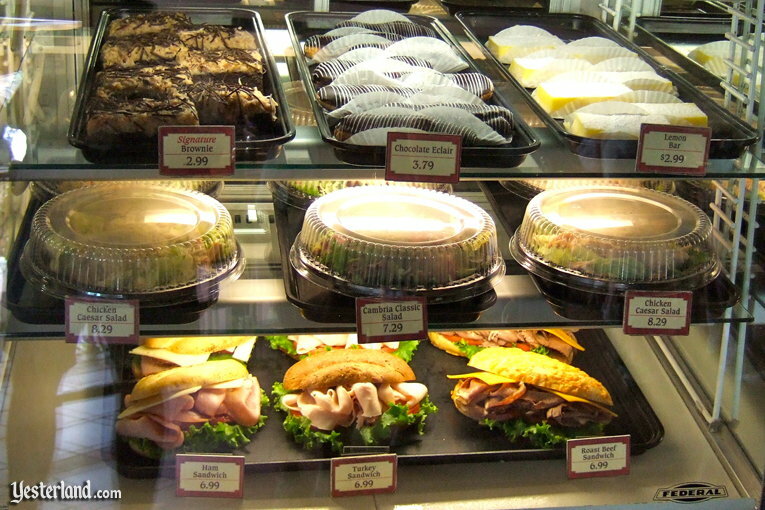 How about a grab-and-go salad or sandwich? 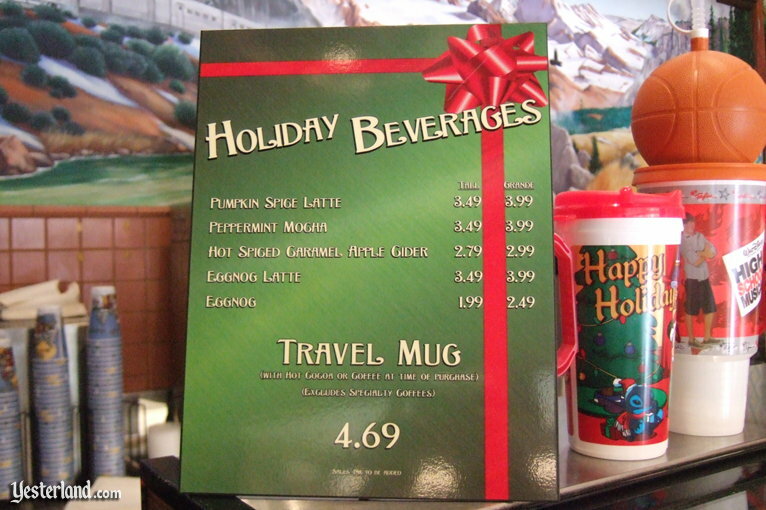 If you visit during the Holiday Season, you’ll find special treats. 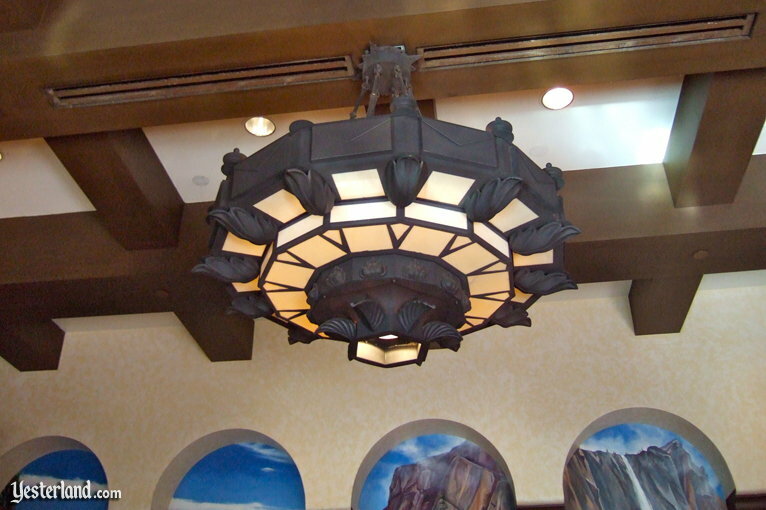 Be sure to check out the light fixtures, decorative tiles, and other interior design features. 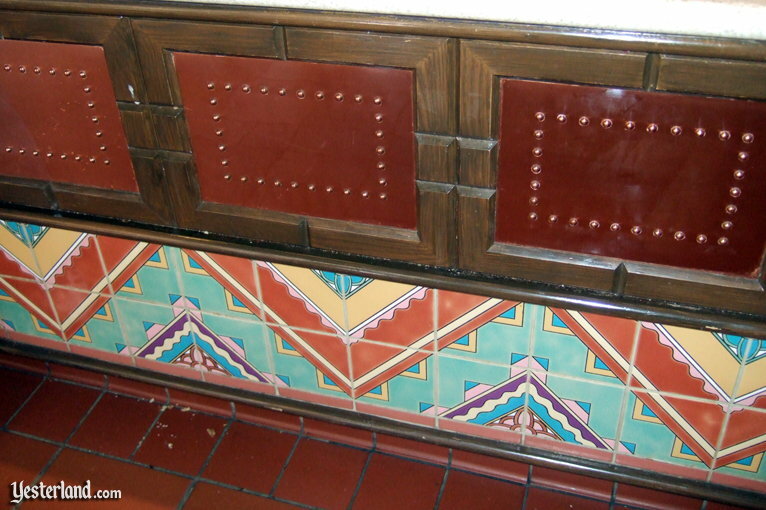 They might look strangely familiar to you if you’ve been to Los Angeles Union Station. 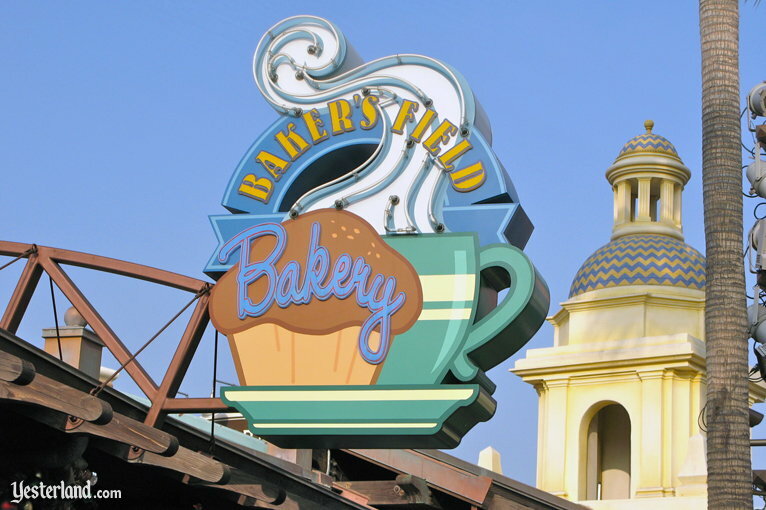 Baker’s Field Bakery at Disney’s California Adventure debuted as part of the new park on February 8, 2001. 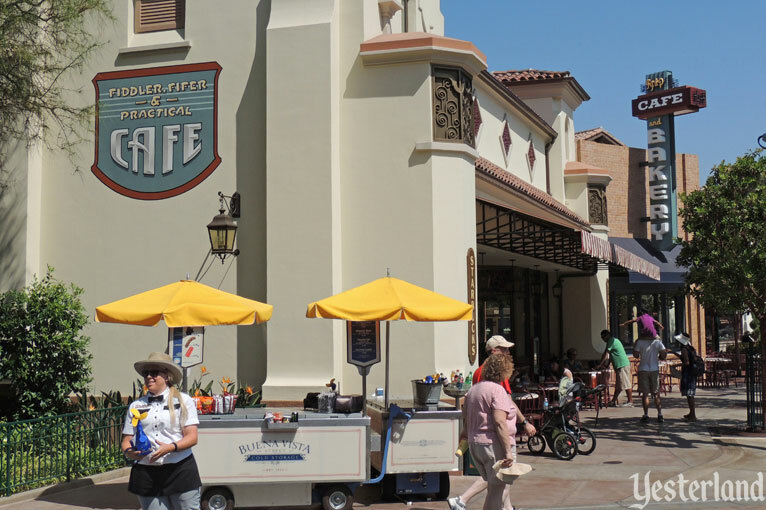 The bakery’s final day of operation was July 31, 2011, when it closed for the construction of Buena Vista Street. 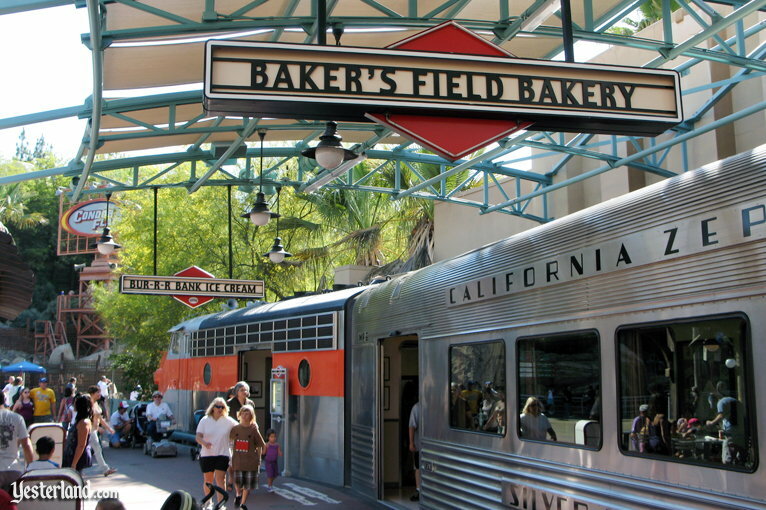 The name of Baker’s Field Bakery was a play on Bakersfield. According to the 2010 U.S. Census, the San Joaquin Valley city of Bakersfield, with a population of 347,483, is California’s ninth largest city—just ahead of the state’s tenth largest city, Anaheim, with a population of 336,265. 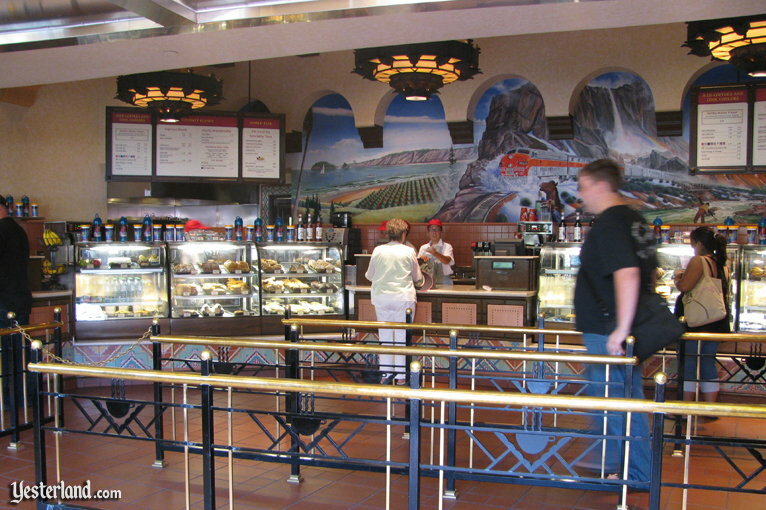 The interior of Baker’s Field Bakery was inspired by Los Angeles Union Station, the magnificent ground transportation hub of Los Angeles. Opened in May 1939, it was “the last of the great railway stations” of the United States. After World War II, travelers turned to airplanes and automobiles. That meant a severe reduction in rail service. Union Station was a little-used relic of the past in the 1970s and 1980s, served only by a few Amtrak trains each day. 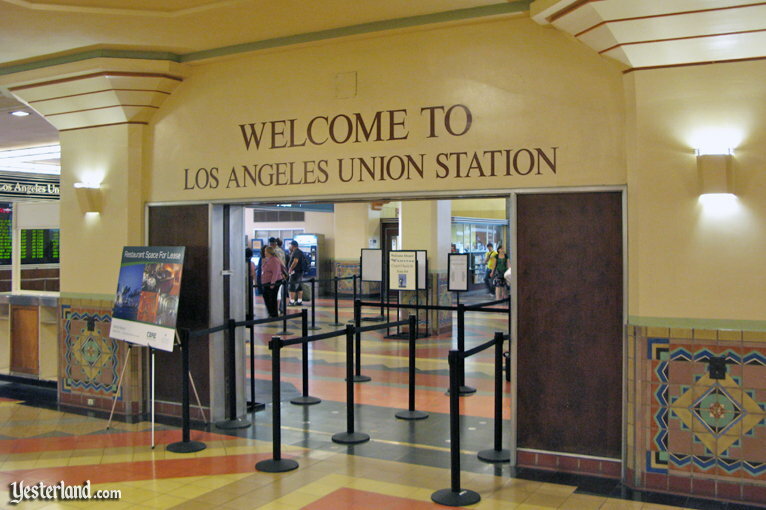 With the launch of Metro Rail rapid transit in 1990, the introduction of Metrolink commuter train service and a thorough restoration of the station in 1992, as well as numerous new bus routes from various transportation agencies, Union Station is once again a very busy place. 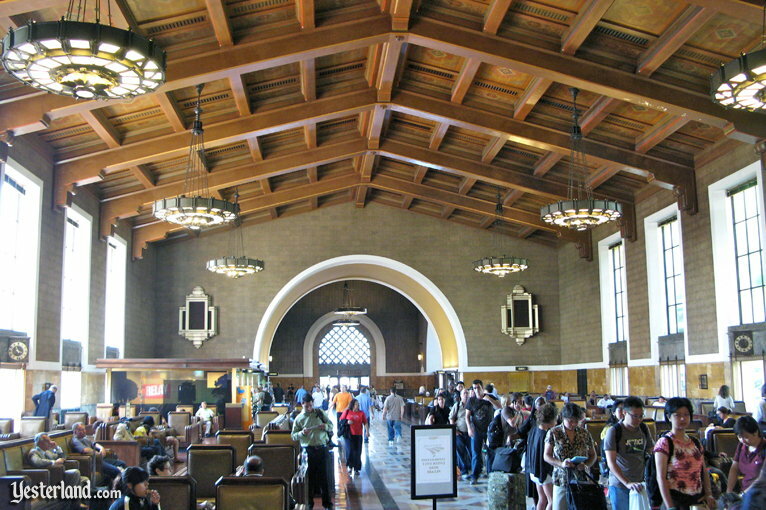 In the two photos of Los Angeles Union Station, notice the suspended light fixtures, wood-beamed ceiling, ornamental ceramic tiles, and art deco touches. Now take another look at the interior photos of Baker’s Field Bakery. 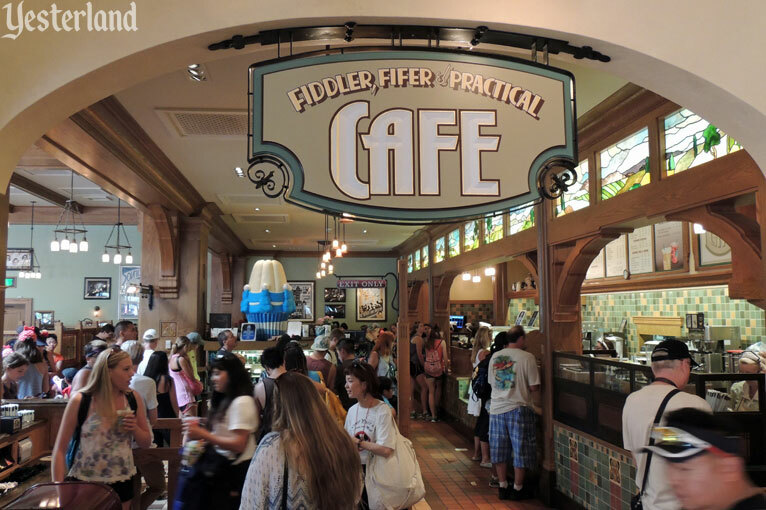 The new spot for coffee and baked goods at Disney California Adventure is the Fiddler, Fifer and Practical Cafe on Buena Vista Street. 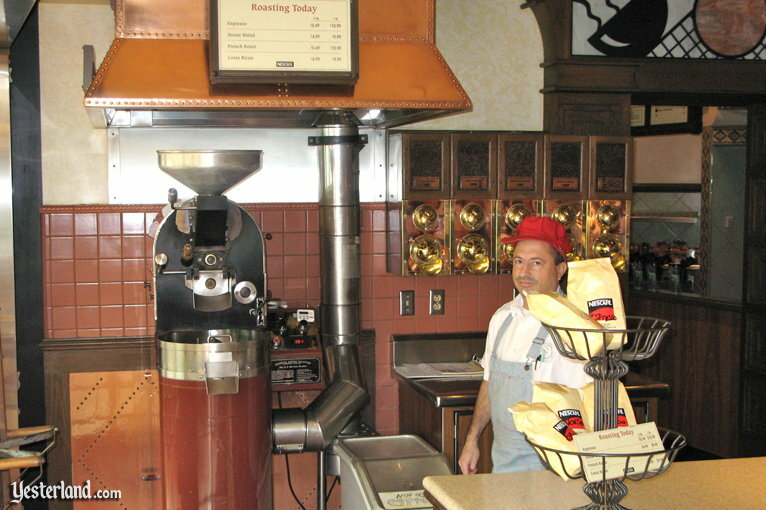 The coffee is from Starbucks’ roasting plants, such as those in Kent, Washington or Minden, Nevada. 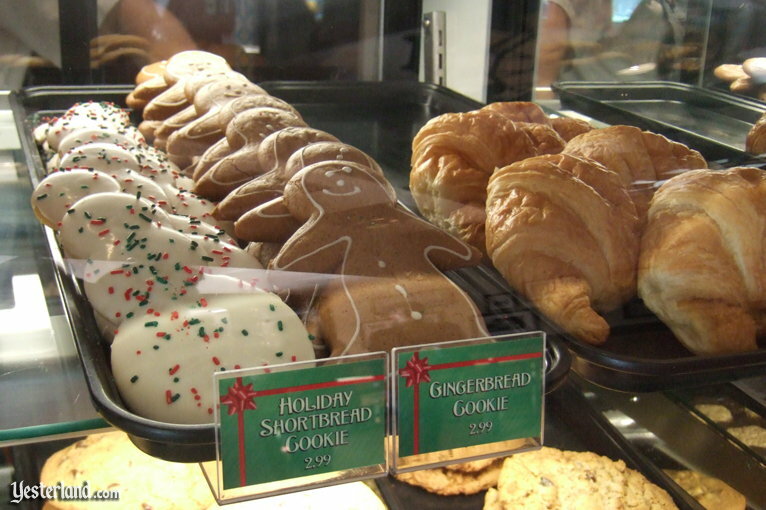 Along with the Baker’s Field Bakery itself, the acrid smoke smell has gone to Yesterland. Updated February December 21, 2018.